TurboCAD Deluxe is ready-to-use 2D drafting, 3D modeling and rendering software. Easily adjust the interface for your level of experience to access hundreds of drawing, modification, dimensioning and annotation tools. Quickly render designs for powerful presentation, share with AutoCAD and more. Users now have the ability to fully customize the Ribbon Interface. You can now Add and Rename Tools, Groups and Tabs. In addition, Tabs may be hidden or renamed, and manually created XML Config files can be directly imported into TurboCAD. UI Themes are also full supported in the Ribbon. Customize Ribbon Interface Short Video. With new, scaleable vector icons, TurboCAD is now fully optimized for 4K monitors. Through dynamic sliders, toolbar icons, the User Interface and other icons in other part of the UI can be resized to optimize readability on higher resolution displays. New functionality has been added where users now have the option of associating Layer Sets with Named Views, giving users a much better way to manage Layers Sets. This powerful tool allows users to select any 2D or 3D object type or a Block and then find all occurrences of that in the drawing. Very detailed selections can be made that include parameters such as pen color and style, brush color and style, layer, even the selected object’s coordinate system. A great tool to use in conjunction with making further global changes to that selected object. This tool which takes properties from a referenced object and applies these to the construction of the next object. This tool provides a fast and efficient method to assign object properties such as line fonts, dimension styles, and wall properties with a single click. The PDF Underlay tool allows you to insert a page of a PDF file into your drawing to use as reference or tracing layer. To use properly as a tracing layer, the file must be a vector PDF, rather than a bit-mapped PDF. As a vector file, you will be able to snap to the endpoints and midpoints of lines in the PDF underlay. Underlays consist of two parts: the underlay style and the underlay insertion. An additional tool, "PDF Underlay to Objects" gives the ability to convert an Underlay into an editable object. The ‘Overkill’ tool removes overlapping lines, arcs, text and dimensions, thereby allowing you to simplify drawings by removing duplicate, redundant Entities. Event viewer shows the count of objects that were changed. Pick-Point-Hatch now works with gaps in 2D objects. For example, trying to fill an area bounded by a Polyline, when there are gaps in the Polyline. Improvements to pick-point also apply to ADT objects (Walls, Doors and Windows), allowing to similarly fill in gaps between these objects. This Local Menu option allows the user to define an obtuse or acute angle dimension based upon the user selecting a vertex point on a 2D object and then defining 2 additional points which in turn define and display the dimensioned angle. Users can now select flat 3D polylines or 3D curves for Surface Extrude tools such as Revolve. Also, 3D Curve and Curve (2D) are now separate tools. ADT objects can now be completely and accurately used with Copy and Linear Array copy tools. For example, the Array Fit Linear now takes into account all of the properties of the ADT object being copied, including Work Plane, Layer, Materials, etc. Previously, this tool could create only one roof object. Now, multiple objects may be created. In addition, the overall processing of all ADT objects in a drawing , including the House Wizard, has been significantly sped up. RedSDK rendered images are now more automatically, accurately and completely converted to a LightWorks rendered image. TurboCAD 2019 now fully supports AutoCAD DWG, DXF and DWF file formats. A 3D Print Check option has been added when exporting an STL file. This tool checks a part for common topological errors such as: non manifold edges, duplicated and collapsed facets, open edges, shells and more. The Print Check tool also displays geometry information such as extents, number of facets/vertices, area, and volume. Export file format for 3D Animation Software such as 3DS, Maya. MotionBuilder and Mudbox. 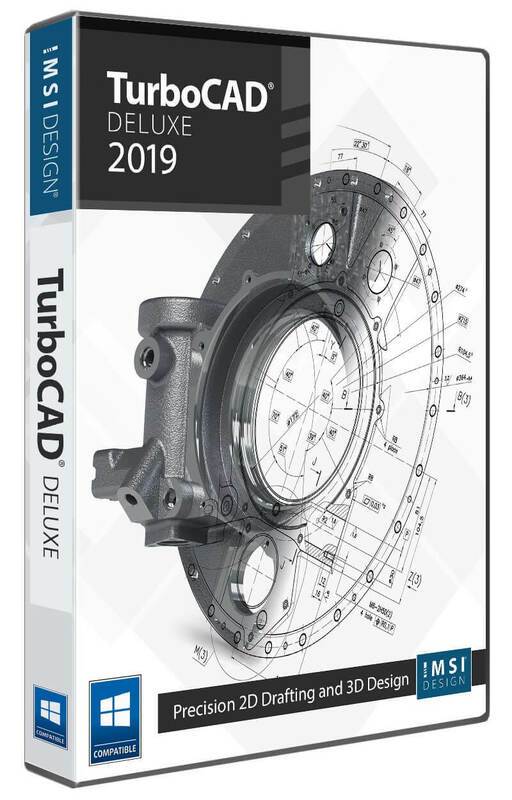 Introduction to TurboCAD®2019, included for free with TurboCAD Deluxe 2019! This introductory training program is designed for users of TurboCAD Deluxe 2019 and is ideal for anyone who wishes to learn the key concepts of 2D drawing and 3D design from the ground up. No experience necessary! This training program is supplied in a convenient, browser-based format which allows the user to follow each session sequentially or to use as a quick reference. New Interface Options - TubroCAD 2019 boasts a new variety of excellent user interfaces including a new RIBBON INTERFACE similar to that found in Microsoft Word and the latest versions of AutoCAD. It also features an updated CADCourse INTERFACE with accelerated keyboard shortcuts for all the commands. Further for traditional users the older CLASSIC INTERFACES type are included so that no matter which interface you prefer you will feel comfortable with the new program. Various types of THEMES are supplied giving you the choice of how you want to interface to appear. At the start of the program a pop-up dialog will appear allowing you to easily choose your preference. Keyboard Shortcuts - This brilliant new feature is set to revolutionize the way people use TurboCAD! 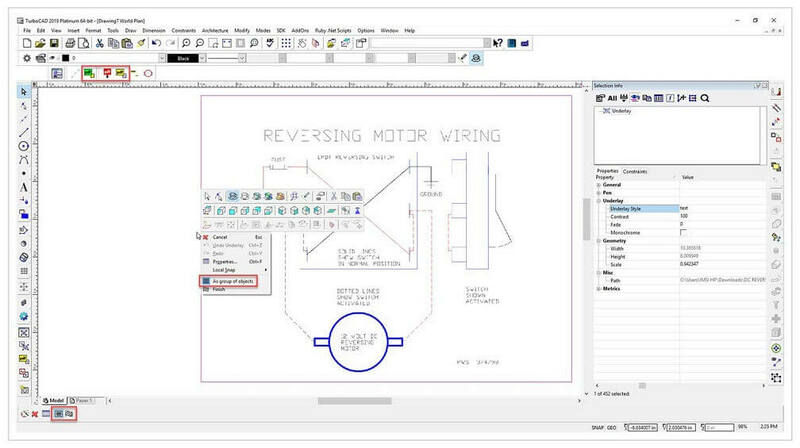 Similar to the functionality found in other products such as Generic CAD or AutoCAD, the user now has the ability to set up keyboard shortcuts that consist of either two or more keystrokes to quickly invoke any TurboCAD command. These keystrokes are sequential and do not need to be a keyboard combination. Isolate and Hide Objects - This terrific new feature allows you to take a complex drawing and to quickly reduce its complexity by allowing you to select certain entities and to isolate them independent of layers or groups. In this way you can focus on the entities that you’re wishing to edit while avoiding overlapping or otherwise complicated entities. In addition to isolating certain objects you also have the choice of hiding additional objects so that you can focus only on the entities that are important during the editing procedure. When complete you can simply hit the Unhide option and the drawing will return to its previous state. Window or Crossing Selection - Users can select objects with a mouse by using the Window or Crossing methods similar to AutoCAD®2019. Drag the mouse from left to right to invoke Window mode and select only objects that are entirely within the blue window. Drag the mouse from right to left to invoke Crossing mode and select only objects that touch the green Crossing window. Optimized for 3D Printing - TurboCAD Deluxe 2019 both reads and writes STL files, and writes 3MF files, the standards in the 3D Printing world. Relative Angle Fields for Wall and polyline update - While drawing walls or polylines, you can now choose to enter an Angle (which is absolute in relation to the world coordinates) or a Relative Angle which is the angle from the immediately previous segment (arc or line). "Add Roof by Walls" Tool Improvement - Previously, you could create only one roof object. But now there is the possibility to create more than one roof. Quick Pull for surfaces - Use the Quick Pull tool to pull or push a closed 2D area of a 3D object (TC Surface) by extruding. Improved Coordinate Measure tool to include 3D - In earlier versions of TurboCAD, the Measure Coordinates of the Point tool could only measure the X and Y values as it functioned like a 2-D tool fixed on the active workplace. Now, the measure coordinates tool behaves more like a 3D tool in that will show the 3D coordinate of the World coordinate system independent of the active user coordinate system. New 2D Create option - New option for "Create 2D" has been added for 3D polyline, 3D Spline tools. When you switch on this option, and polyline(spline) is flat then a 2D object is created instead of 3D. 3D Slice - TurboCAD®2019 makes it easy to slice, or divide, one or more 3D objects into new objects, by specifying the slicing plane. The 3D slice tool offers the ability to slice by line, by plane, by workplane, by surface, and by facet. Design Director - Organize, access, and explore design alternatives easily in the Design Director Palette. Create layer templates, light templates, camera templates and powerful layers for use on different designs. Layer filters, that are .dwg compatible, help you manage large, complex drawings with ease. TurboCAD Deluxe 2019 layers are AutoCAD®2018 compatible, including a layers dialog based upon ‘Design Center’. Status Bar Memory Display Update - Once the Rendering mode for a selected object is initiated; the TurboCAD status bar now displays the respective memory usage along with the processing time. 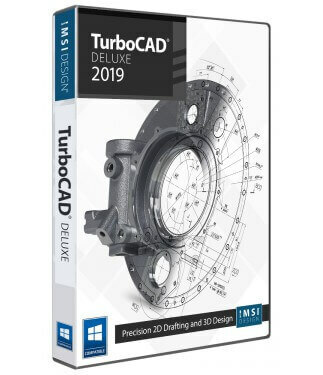 Industry Standard Files Supported - TurboCAD Deluxe 2019 nearly 30 industry-standard formats making it easy to share your work or as a companion product. Improved AutoCAD DWG/DXF Read/Write filters - TurboCAD® has always offered excellent compatibility with native AutoCAD®2019 and AutoCAD®2019 LT files. Filter enhancements offers improved file sharing with AutoCAD® 2019. Xref Manager - Manage external references (Xrefs) like a parts catalog in your TurboCAD® drawing. Xrefs can also be exported with DWG or DXF drawings for greater AutoCAD®2019 file compatibility. SketchUp SKP Read/Write Filters - TurboCAD® 2019 offers both Read and Write file filters based on the latest SketchUp APIs. Import detailed information from your SketchUp model into TurboCAD. Supplemental rendering, lighting and materials information is also imported. You can also convert your TurboCAD® models into native SketchUp® (.SKP) files for seamless import into Google SketchUp.